The Sheep Whisperer: Yipes! Stripes! 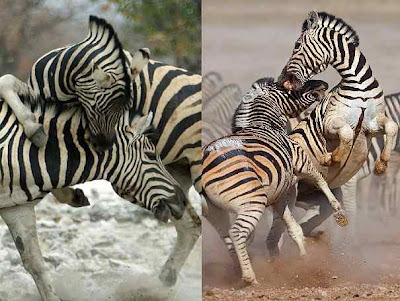 Zebras Got Them! 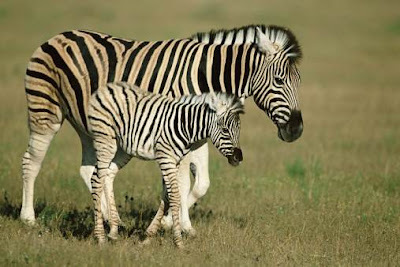 Zebras , along with donkeys & horses, belong to the "Equidae" family in the "Animalia" kingdom. 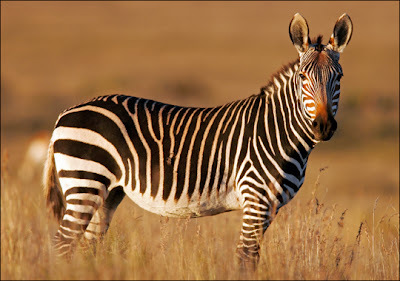 There are 3 species of Zebra; the plains zebra, the mountain zebra, & the "Grevy" zebra. 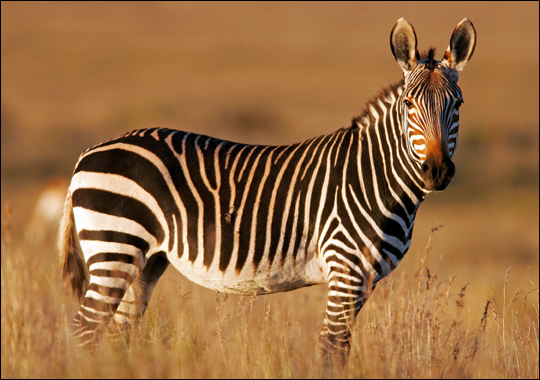 All 3 occupy the grasslands of the Savanna as their primary habitat, yet ewe will find some zebras in the woodlands & mountains. 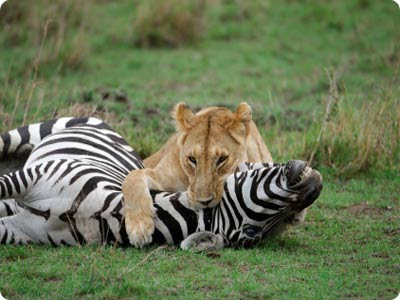 Zebras are herbivores. I enjoy the grasslands , especially when they offer such a large buffet! Did ewe know that the Savanna runs "Family Specials"? Eating out is now possible! the wild. The Savanna has its share of predators, all looking for a tasty meal.Lions, cheetahs, wild dogs, & hyenas all are carnivores, preying on Zebras. 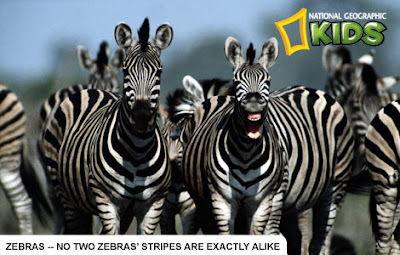 Zebras form herds for safety, their stripes all blending together, making it more difficult for predators to single out the weakest animal, especially at night! 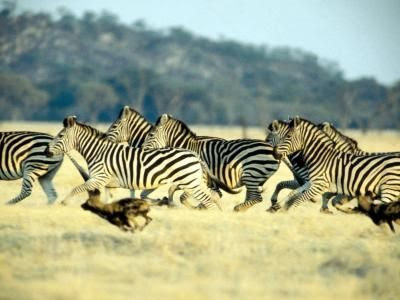 Zebras are intelligent & social animals.They gather in herds, which contain smaller groups called harems. 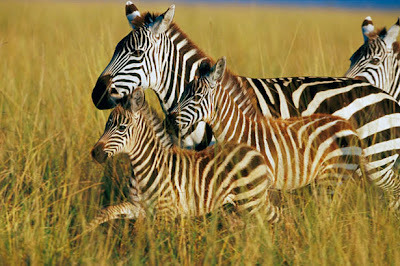 Each harem consists of a lead male, called a stallion, several females, called mares, & the young Zebras, known as foals. The male is the head, but will yield the choice of direction for the group's movement to the female. All members of a harem are able to recognize one another. We enjoy Each others' company! It sure beats being eaten by a lion! This is one fast cat, but she's not catching me! Hee Hah! Don't forget to Zag after Ewe Zig! No Lion, it works almost every time! Both males & females can fight like cats & dogs!It's all about being #1! 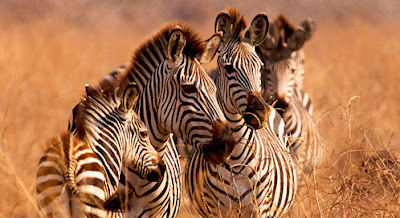 Zebras are quite social outside of mating season! They bond by mutually grooming each other's head, neck, & shoulders.They also nibble at one another, sniff, & rub heads & shoulders! They converse through snorts, sniffs, barks, & brays. Snorts are given when uptight, & Sniffs are friendly greetings. Barks & Brays are warning signals for possible danger! We either will hang together , or hang separately! 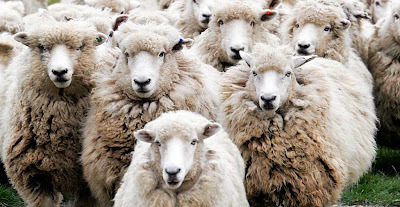 Did Ewe know that "We" need some "Alone Time"! Two, Four, Six. Eight, Who do we appreciate? The Shepherd!Yeah! Today is a great day to acknowledge once again, that having a Good Shepherd gives Ewe a real advantage! Happy Trails to Ewe!